I recently listened to the most eye opening lecture I have ever heard on the issues of race and racial marginalization. In this post I want to distill one part of the lecture which explained why minorities continually level the charge of racism against the dominant culture of white Americans. The lecture from which I am pulling this information was given by Dr. Carl Ellis at the 2005 Desiring God National Conference on the Sovereignty of God Over Suffering. His particular lecture was called the Sovereignty of God and Ethnic Suffering. I highly recommend you listen to it. I have posted the video, compliments of Barnabas Piper, in a previous post, and you can download the audio here. Please consider this post as a taster, encouraging you to hear the lecture in its full form. Christians need to lead in racial reconciliation, and that starts by hearing the truth about racial tensions. When I heard discussions of racism, I would frequently ignore them, because I had never disliked, mistreated, or preferred someone on the basis of their skin color. I had grown up in the South, which means that I did not talk about race relations with African Americans, I lived them out every day, because about 55% of African Americans live in the Southeastern region of the United States. Over half the African American population lives in 8 states, which means I grew up with lots of African American friends. 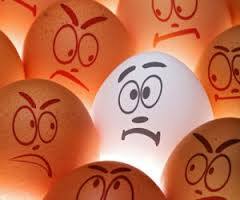 When I hear the charge of racism, I automatically think, not me – it must be someone else. If someone accuses me of racism, they must be race baiting in the vein of Jesse Jackson. And with that thought, I would deny their reality. The problem here is that both of us are right. Individual African Americans are experiencing marginalization in our culture on the basis of their race, socioeconomic status, age, education level, family background, etc. I, as an individual, have never intentionally marginalized an African American individual on the basis of their race. The disagreement arises when I, and most white individuals, deny the reality of marginalization because I have never personally marginalized someone on the basis of their race. I am wrong for not seeing the bigger picture. The disagreement is not helped by the fact that much of the marginalization African Americans experience gets wrongly reduced to racial marginalization. When this happens, the African American community is wrong for confusing the issues. There are more factors at play in these conversations than one person marginalizing another person. The problem is that we just don’t know how to illuminate those issues in our conversations. Ultimately, both the dominant culture and the sub-dominant (minority) cultures need to speak with more clarity and precision as we both explain and defend our experience in marginalization. Before we can speak more helpfully, we have to understand more fully, which is why I share with you Dr. Ellis’s Window of Marginalization. The following graphic explains marginalization by pairing the type of marginalization experienced with the motivation behind said marginalization. Relational Marginalization: Person to person, face to face marginalization of individuals or groups of individuals by another individual or group of individuals. Systemic Marginalization: This is the marginalization of individuals or groups of individuals by a time honored set of principles, ideas, or laws. Marginalization by Design: This is when an individual or group of individuals is marginalized with specific intention working towards the subjugation of that person or persons. Marginalization by Default: That is when and individual or group of individuals is marginalized by a lack of power or a perceived lack of power. The panes are labeled 1,2,3, and 4. Frequently, when someone who experiences marginalization cries out against that marginalization, both the marginalizer and the marginalized usually miss what the other is saying because we are usually discussing different window panes. When a young black man grows up in a sub par school in the inner city, he experiences systemic marginalization by default (pane 4) because of his socioeconomic status. 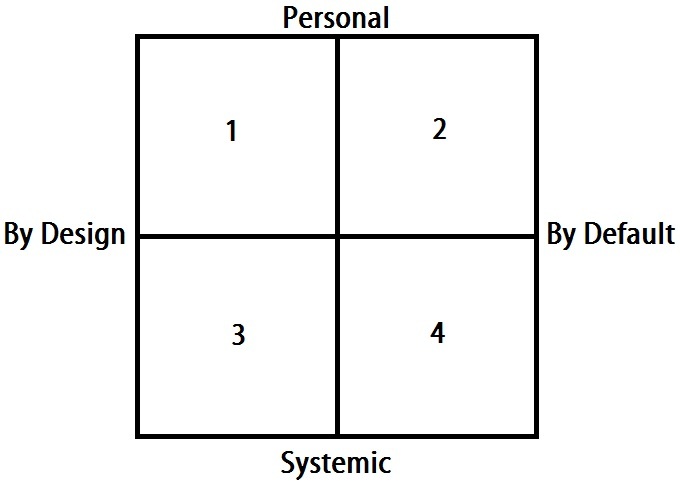 When he makes it into a state sponsored university, he is forced to pursue a network of relationships limited to one or two racially segregated fraternities instead of exploring a larger network of relationships offered through all the fraternities, limiting his future network before it even began; he is experiencing systemic marginalization by design (pane 3) because of his race. When he leaves college, he applies for a job and loses it to another graduate with similar accolades that went to a better, private university; which is when he experiences personal marginalization by default (pane 2) because of his education. When this man cries out about the marginalization he experienced in not getting a job he is qualified to receive, he will likely view all of these very real marginalizations through the wrong pane. He will likely describe his experience as though he were intentionally and personally marginalized (pane 1) on the basis of his race when he was denied a job. The white majority culture will rightly deny the accusation of intentional, personal racism, because they did not intentionally marginalize this man on the basis of his race. He was instead personally marginalized by default on the basis of his education. If we want to have helpful conversations about racial reconciliation it is vitally important that we understand all the ways in which people are experiencing marginalization. We have to take responsibility for our role in marginalization. And most importantly, we need to work to eliminate wrongful marginalization. My contention is that the church should lead the discussion. More than that – I think we are the only institution who can lead the discussion. God, before time began, set forth the means by which Jesus would bring together a single, united group of people from every nation, race, class, education, and gender who would be conformed into his image through the ever constant work of the Holy Spirit. It is only through Christ that we can truly see one another as a brother or sister. This side of heaven, the church, Christ’s ambassador, is the only hope we have of reconciliation to one another.